There were Ismaili states and constitutions during Fatimid times and Hazrat Ali. In 1905 the Imam of the time ordained the first modern era Ismaili constitution for East Africa followed by National constitutions in many other countries. The first Ismaili Constitution was issued in Zanzibar on September 9, 1905, but was not published in printed form until 1922 when it appeared in English and Gujerati (more recently it was also translated into German). Although it has since been revised several times, the basic laws remain the same as those first laid down by Aga Khan III. Designed for a society which was still largely primitive, the original 1905 draft was a splendid testimonial to his scholarly and modern mind. He issued a Holy Firman ordering Ismailis to abide by it and instructed local leaders to send him regular reports about every aspect of the community's life. The practice is still followed and his young successor is often snowed under with communications from Ismailis all over the world. On March 21, 1961, the Ismailia Federal Council for Pakistan came into existence. Another Constitution was put into effect for the Ismailis of Pakistan on July 11, 1962.. On the basis of the Constitution of 1962 for Pakistan, each Supreme Council was responsible for supervising the activities of some of the 23 Divisional. District and Local Councils throughout the country. In India, the Federal Council, located at Bombay directed the affairs of four Regional Council for Maharashtra, Gujrat, southern India and eastern India. At the bottom of the hierarchy, there were 28 Local Councils in India, for south Bombay, north Bombay, Jamnagar, Kutchh, Surat, Hyderabad, and so forth. On March 21, 1968, a third Constitution was promulgated in India. “Last year a new Constitution was introduced for my jamat of India. Many of you may not know that the earlier Constitution was dated 1946, that is for 22 years, our jamat implemented the same Constitution. It was my view, and it is my view, that circumstances have changed sufficiently so that a new Constitution should be introduced. If I have seen fit to introduce a new Constitution in 1968, this means that I may see fit to introduce a new Constitution in 1970, or 72, or 74. This means that no Constitution for our jamat is a firm, solid, immovable document. It is a document, which is created to assist the jamat to administer its affairs satisfactorily and in keeping with the times. Thus, I wish my spiritual children to understand that if through the implementation of this Constitution, it is found that certain matters could be better pharsed, could be amended, could be improved, the Constitution will be continuously amended. The Constitution of our jamat here in India, like in East Africa, like in Pakistan, is a living document and where it is not in keeping with the tradition of the jamat, or in keeping with what the times require, amendment will be introduced." The Constitutions of East Africa, Pakistan and India were alike in spirit, but differed in several points according to the different circumstances prevalent in these countries. This was explained by the Present Imam upon his sanctioning The Constitution of the Councils and Jamats of Shi'a Imami Ismaili Muslims of Pakistan that, "Look to the spirit and not the letter of the Constitution." 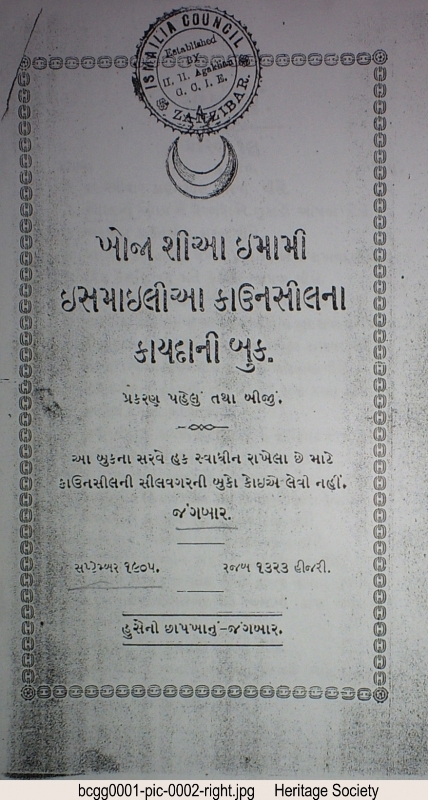 This is the cover page of September 1905 first Ismaili Constitution promulgated in Zanzibar.